A native of Canada, Dr. Greenhow completed his Honors Bachelor of Science and Doctor of Medicine degrees at Queen’s University in Ontario. He then pursued Orthopedic Surgery in Vancouver, completing the prestigious five-year program and serving as Chief Orthopedic Resident in his final year. Following this, Dr. Greenhow was selected to complete a one-year Sports Medicine and Arthroscopy Fellowship at the internationally renowned Fowler Kennedy Sport Medicine Clinic in London, Ontario. This clinical fellowship was under the direction of Dr. Peter Fowler, former President of the American Orthopedic Society for Sports Medicine. At the completion of this fellowship, Dr. Greenhow earned his Diploma in Sports Medicine (CASM) specializing in Joint Replacement as well as Sports Medicine and Arthroscopy. 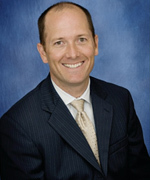 Dr. Greenhow's specialty training in arthroscopy and minimally invasive techniques lead him to pursue extensive additional training in minimally invasive joint replacement of the hip and knee, in combination with computer navigation, robotic, and patient-specific technologies. Together with Dr. Loucks, he was one of the first three surgeons in Colorado to perform the minimally invasive, muscle-sparing (MIS) Anterior hip replacement procedure. Dr. Greenhow is one of 4 surgeons in the US involved in an ongoing prospective gait analysis study, comparing Anterior hip replacement with the more traditional posterior approach. Dr. Greenhow is also one of the designing surgeons for a new femoral stem implant used in hip replacement surgery, a new patient-specific knee replacement technique (Medacta MyKnee ®) using CT scan technology and 3D printing, and a total knee replacement system which allows for improved knee kinematics and improved stability (Medacta GMK Sphere ®), all of which are being implanted around the globe. Dr. Greenhow is currently a consultant for an international orthopedic implant company based in Switzerland (Medacta, Inc.). He serves on the Educational Advisory Board for Anterior Approach Hip Replacement and acts as an Instructor in the US and internationally. Dr. Greenhow serves as a proctor and instructor for a national and international training center, based in Denver, with regularly scheduled lectures and cadaveric labs. Dr. Greenhow also proctors surgeons from across the continent in their own hospitals, helping to teach the Anterior Approach technique for hip replacement and Patient-Specific technology for total knee replacement. The video you are about to see is of an actual surgery and contains graphic content. Please click here if you want to continue.